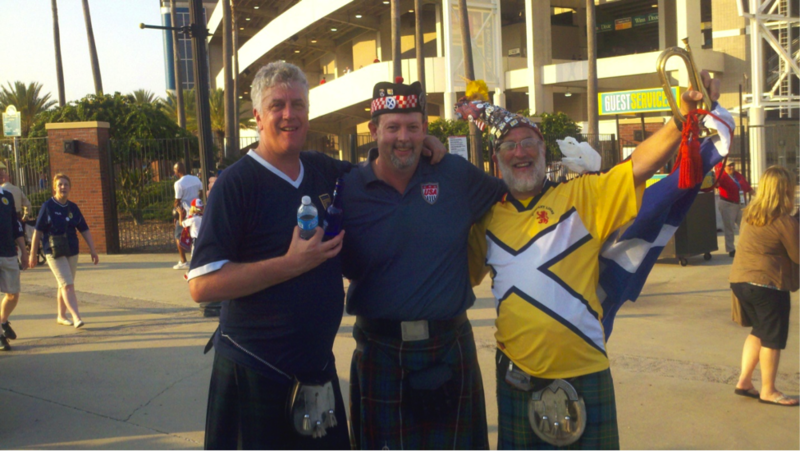 John Daly contacted me regarding the recent visit by the Tartan Army to North Florida. To let you guys know the ones that did make the game made a great impression upon the locals here in Florida. I work with a lot of people who commented about the number of kilts they saw. They also commented on how fun it was to be around many that were here. It seemed everywhere you went you saw elements of the Tartan Army. There is a reason that the match broke records here in the State of Florida regarding attendance. First off I do think football has grown a lot over the last decade, in America, and that contributed to the numbers at the game. But what really got the numbers to this game was the opponent. The U.S. Soccer Federation had a target ticket sales set at 25,000. This target was smashed with nearly 44,500 tickets sold. The last friendly in Jacksonville 12 years ago with the Germans only sold 19,000 tickets. Right now the World Cup Qualifier in Tampa next week is nowhere near the numbers sold at the Scotland friendly match. The Southeast United States is abundant with Americans with Scottish Heritage. My mother and most her family is from the Cape Fear region of North Carolina that has a huge number of Scots. This area had the biggest concentration of Scottish immigrants in America; many settled here in the early to mid 1700’s. My mother also went to Flora McDonald College, now Flora McDonald Academy in Red Springs, North Carolina. Flora McDonald lived in this region, before and during the American Revolution, and her husband Alan MacDonald fought at Moore’s Creek during the American Revolution. Some of my grandfather’s Gibson (Clan Buchanan) ancestors were with the Scots at this battle. This was also one of or if not the last known Highland Charge with Claymores. Flora and her husband returned to Skye in 1779. Most other Scots remained including many of my ancestors. You can still open up a phone book in this region and look at a great number of Scottish last names listed. Another famous American Scot from this area is American Astronaut Bill McArthur. He is a distant relative by marriage and my grandmother taught him in High School. In May 2009 he was awarded an honorary doctorate from the University of Strathclyde in recognition of his contribution to space science and engineering, as well as his outreach work with the Scottish Space School. Growing up I would see him annually at the Red Springs Scottish Games. Another famous American Scot, from this area, is U.S. Army Four Star General, Dan K. McNeill. He served Commander of the Coalition forces in Afghanistan from 2002 to 2003 and later Commander of the International Security Assistance Force in Afghanistan from 2007 to 2008. Both of these people are descended from Scots that settled the Cape Fear Region. My Grandmother’s last name was Maxwell and her great great Uncle was Alexander Hamilton Stephens, the Vice President of the Confederate States of America during the War Between the States. Alexander’s grandfather Alexander Stephens was, a Jacobite, at the battle of Culloden. He was an 18 year old from Leith and became a fugitive after the battle. He fled to America and ended up getting his revenge serving as a Captain in the Continental Army under George Washington. I may be American but the Scottish roots run deep. When visiting Scotland I always have a feeling that I am at home. You all live in a beautiful country even if the weather gets rough at times. I know as a football fan it has been tough of late. I witnessed, in person, the Czech Republic player dive back in September. Those two points were the difference in Scotland making the playoff match for the European Cup. Anyway I just want to say hang in there and great things will happen. As a fan base the Tartan Army is as good as it gets. Hopefully soon the football team will reach the same level, you all deserve it.